A 22-year-old gravida 2, para 1 (G2P1) woman with immunoglobulin anti-D prophylaxis, insulin-treated gestational diabetes and first-trimester cytomegalovirus (CMV) infection vaginally delivered a 39-week boy weighing 3720 g (90th centile) and with Apgar scores of 8 and 10 at 1 and 5 min. Prenatal ultrasonographic assessment throughout gestation was normal. Nursery stay was uneventful. He was discharged on day 2, with a normal examination, except for the appearance of jaundice, with a transcutaneous bilirubin of 248 µmol/L (cut-off 250 µmol/L), not meeting the criteria for phototherapy. A follow-up clinic on day 4, arranged for bilirubin measurement and CMV testing, surprisingly revealed poor general appearance, lethargy, very icteric skin and a minor weight loss (9% of birth weight). Both liver and splenic edges were palpable. Vital signs were normal. Blood routine showed haemoglobin of 19 g/dL, haematocrit of 58%, white blood cells 11.6x109/L and platelet count 128x109/L. Biochemistry revealed total serum bilirubin of 694 µmol/L (cut-off 350 µmol/L), indirect bilirubin of 681 µmol/L, and a normal glucose, urea, creatinine and coagulation study. He was admitted for intensive phototherapy, and his total serum bilirubin level decreased to 289 µmol/L in 9 hours, but rebound hyperbilirubinaemia followed whenever attempts to discontinue were made. He remained icteric, hypotonic, required enteral tube feeding and had a persistent hyponatraemia treated with oral sodium chloride. On day 9 cranial ultrasound (US) was normal, but abdominal US uncovered enlarged adrenal glands, with a hypoechoic heterogeneous mass, measuring 32×21×17 mm on the right and 33×23×17 mm on the left, suggesting a bilateral adrenal haemorrhage (AH). CMV viruria came negative, and subsequent studies showed increased thyroid-stimulating hormone (TSH) and normal free thyroxine 4 levels, leading to the initiation of levothyroxine treatment on day 14. Transfer to a tertiary paediatric hospital was arranged on day 28. Abdominal Doppler US on day 30 confirmed the bilateral AH (figure 1A). The complete hormone evaluation showed raised adrenocorticotropic hormone (ACTH), prolactin, aldosterone and renin, and low cortisol level, which, together with an elevated TSH, disclosed hypothyroidism secondary to adrenal insufficiency (AI). Under hydrocortisone treatment, started on day 39, hypotonia resolved and feeding improved with an adequate weight gain. Neurological and metabolic evaluations were normal. Thyroid parameters normalised at 3 months and levothyroxine was suspended. At 6 months fludrocortisone was added to control the inappropriately activated renin-angiotensin-aldosterone system. Two-month and 6-month follow-up US revealed an ongoing and significant regression of both adrenal masses in size and echogenicity (figure 1B,C). Presently, at 22 months, he remains asymptomatic but continues on corticosteroid replacement therapy for hormonal control. The most recent US, at 12 months, showed an even smaller bilateral haemorrhage with a maximum diameter of 6 mm. 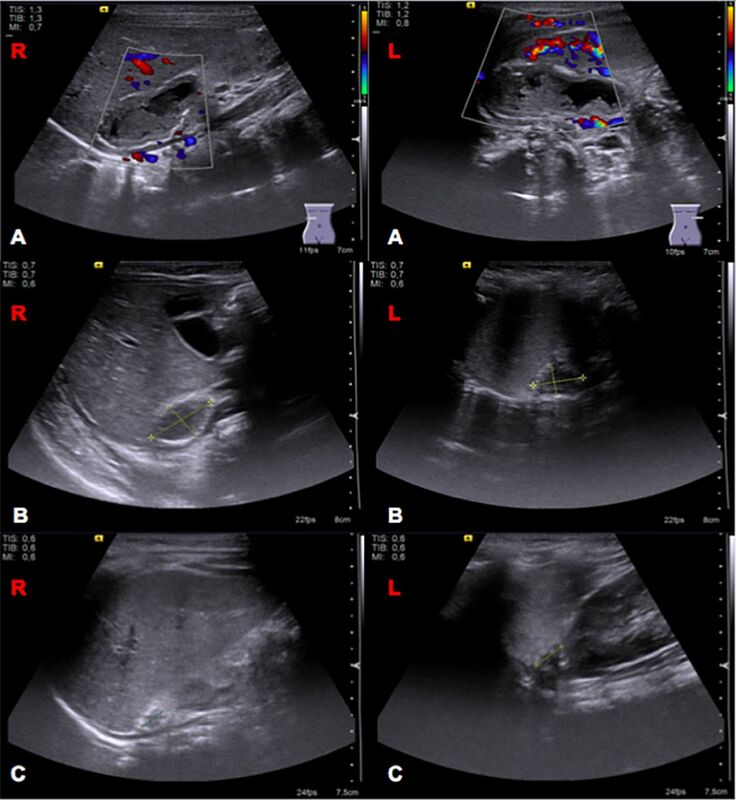 (A) One-month ultrasound (US): hypoechoic and heterogeneous ovoid mass with no blood flow at colour Doppler and surrounding calcification compatible with haemorrhage. (B) Two-month US shows at least a 50% bilateral decrease in the cystic mass area and echogenicity. (C) Six-month US shows further bilateral decrease in size and echogenicity. L, left adrenal gland; R, right adrenal gland. Both serum cortisol and ACTH should be measured in newborns with AH to exclude primary AI.2 Hyponatraemia in our patient was most likely the result of hypervolaemia due to an increased antidiuretic hormone (ADH) secretion elicited by cortisol deficiency. AI in a newborn with bilateral AH requires supplementation with both glucocorticoids and mineralocorticoids.2 A close follow-up using serial US is required, and AH usually resolves between 3 weeks and 6 months.2 ,3 However, a longer period of time is possible in accordance with our case. Bilateral adrenal haemorrhage (AH) is a rare neonatal event that should be recognised in the presence of persistent unexplained jaundice and predisposing factors. Abdominal Doppler ultrasound is the examination of choice in neonates with suspected AH, allowing organ injury assessment and exclusion of other abnormalities at diagnosis and a non-invasive monitoring at follow-up. AH is usually self-limiting, but rare bilateral cases may cause adrenal insufficiency and require corticosteroid therapy.
. A rare cause of hyperbilirubinemia in a newborn: bilateral adrenal hematoma. Turk J Pediatr 2008;50:485–7. Contributors GNO conceptualised the case report, did a literature review, integrated the data and wrote the manuscript. ID and MJN contributed to the conception, drafting and critical revision of the article. AM closely supervised the management of the patient and the writing of the case report.